Eikographia is an amazing site. If you haven't yet, add it to your list of regular visits, as it comes with some stellar and comprehensive overviews of projects, and an added twist of in-depth analysis of the remnant (or overt) iconography present in the work. A recent multi-part example covering a 2007 competition The Great Pyramid (TGP). 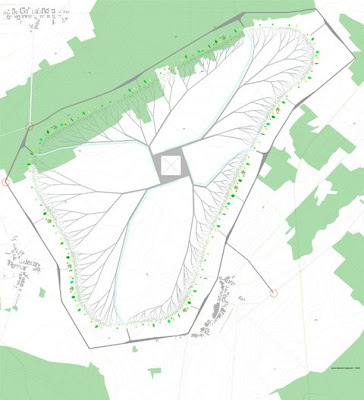 The overall plan has a branching structure, much like a tree or the veins of a leaf. This is explained in a bit more detail from Eikongraphia: "Atelier Bow-Wow has considered the whole site as a single void, surrounded by a ring road. Inside that infra ring there is second ring of leaf-like pavilions, where one can meet in a group, or retreat individually. ...'The bedrooms are treated as ritual spaces, where a visitor spending a night on the site can meditate facing the pyramid landscape', Atelier Bow-Wow writes: 'Each room has its own individual path that eventually connects to the pyramid, forming a special connection between the guest and the monument.' ...How cool is that; every griever has its own, unique path to the pyramid. As the pyramid grows more paths can be constructed. The void in between the paths accommodates that growth. The creation of a new path results in the fragmentation of the gardens that materialize the void. Each new path comes with a new garden, planted with a new species. 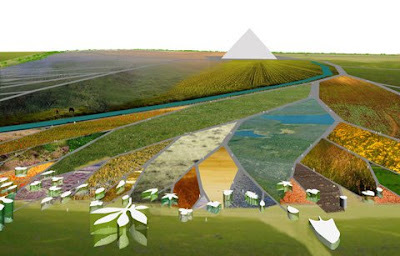 As the dead are stacked in the pyramid, new species – new life – is emerging on the field below." The leaf-shaped structures are an interesting metaphor, further explained on Eikongraphia: "From the grave to the cradle, we could joke. 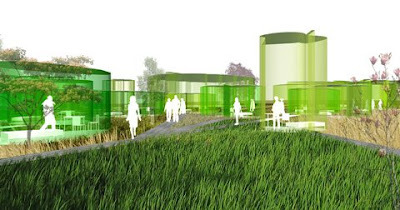 But seriously, I think growing new (plant) life would bring a positive atmosphere to the complex. Unless, of course it is autumn… or winter. Speaking of which: are the leaf-pavilions, scattered on the ground, secretly a metaphor for the autumn, which in its turn could be a metaphor of saying goodbye? I must be imagining that." I guess for me beyond the whole argument of meaning - the both physical and literal connection to nature. It has a special resonance for me, as I did a project for my senior thesis at university desiging a cemetery that combined bereavement research and environmental design research to aid in healing the families and friends of those buried. This really galvanized how important the infusion of nature into everyday life is, and has shaped the way I have approached the profession. 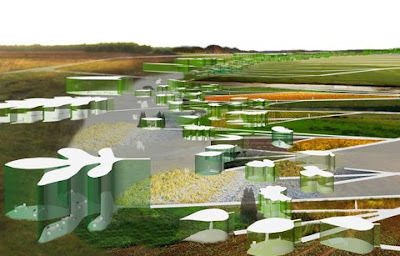 The competition is great in this way of looking at a cemetery designs and addressing these issues. While the other ideas were compelling in concept and form (in fact I really like the MADA s.p.a.m entry of a floating inverted pyramid) most of them missed this specific ingredient which is essential to healing the spirit... that of nature. Form is one thing... concept another. All of these are fine, but we cannot disconnect design from things that are proven to aid in the bereavement process.